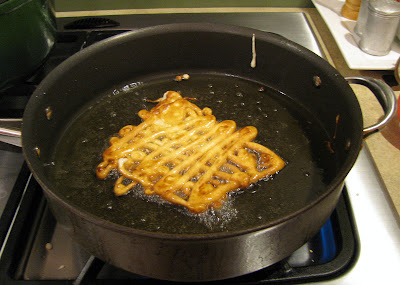 Life on the Hay Farm: Funnel Cakes! 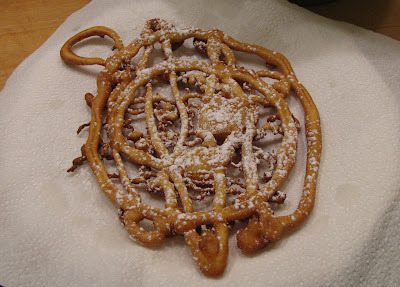 I'm wanting to do some fun stuff in the kitchen this summer and funnel cakes was on the top of my "want list." I love getting a good crispy, chewy funnel cake at the Stock Show every year but don't like the price they charge for them. I knew making them at home would be easy, if messy. The recipe I used is very simple. The ingredients are all pantry staples. Don't forget the funnel (not pictured, drat the luck)! 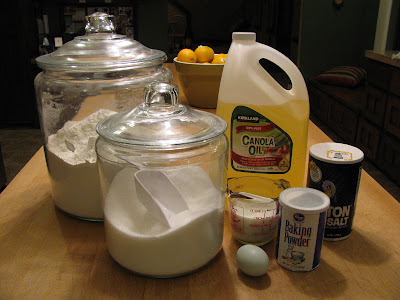 Flour, sugar, salt, baking powder, egg, milk, and oil for frying. And yes, that is a blue egg. Isn't it darling? 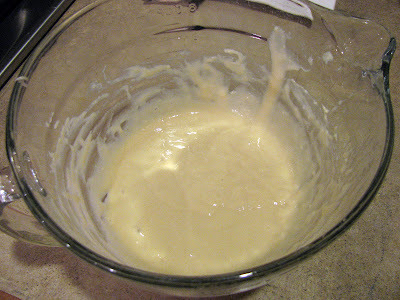 After you mix the batter, add more milk if necessary to get the right consistency. I'm about to die of funnel cake lust right about now. It smelled so good! 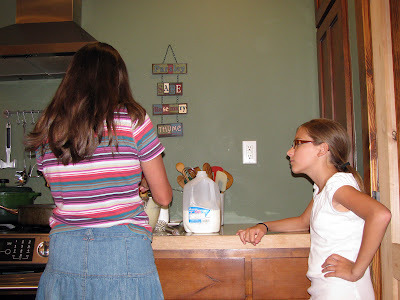 Don't forget to have a few kids around to ask, "Why are you doing that?" and "When can I do one?". The experience won't be the same without it. 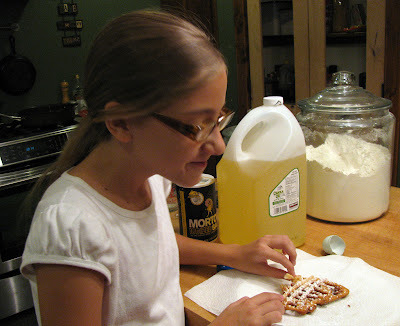 Top them with cinnamon sugar, honey, maple syrup, chocolate syrup....our favorite is powdered sugar. I'm salivating, sorry. They're a hit with Maddy! 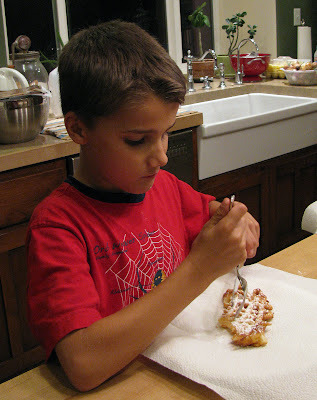 Tristan has not grasped the full funnel cake eating experience. Put those utensils down! Are you having any fun at all? 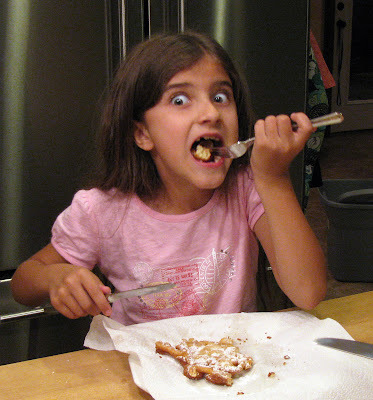 Morgan is also using a fork, but there's no doubt she's enjoying her treat! Honestly, these were better than any we've ever had! And the mess? That's what the kids are for! How fun! My kids would love these! It would be fun to try to make a treble cleft! If I can manage to fit it in I will try to have my family make these on the 4th. I want to try over my bbq though. You think it would work?